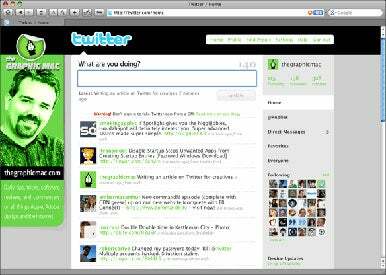 Twitter had a banner year in 2008. Seventy percent of Twitter’s membership joined last year, at an estimated 5,000 to 10,000 accounts per day. You may be wondering what all they hype is about. Is it just another chat client? Well, sort of. Twitter refers to itself as a micro-blogging service, where users can type 140 characters or less and have it instantly appear in the Twittosphere for the world—or, more important, for the people who “follow” you on Twitter—to read. Think of it as text messaging to a group of people all at once. But how can this be useful or productive to the average creative Mac user? I’m one of those people who jumped on the bandwagon last year, and at first I asked the same questions. It wasn’t long before I found a use for Twitter that fit nicely into my daily routine. I don’t use Twitter as a random chat service like so many users. You won’t find me tweeting about what I had for breakfast this morning, or what I’m watching on TV. Well, maybe a little bit—you don’t want to be all business, all the time. But for the most part, I use it as a resource for finding links to interesting articles, software, trends, and communicating with other Mac users with similar interests. I started by following people whose Web sites I enjoyed reading and who also posted their Twitter accounts on their blog. Once you find a single person to follow, you can see who they are following and who is following them. This generally will lead to several more people you wish to follow, and so on. Before long, I was following nearly a hundred people, and had a few hundred following me. Many useful Web sites also have Twitter accounts that are simply used to let you know when a new article or blog post has been made on their site, such as Macworld. There are a ton of Twitterers out there for virtually every topic: Photographers, musicians, videographers, local news and updates. I actually picked up a little freelance work from someone who follows me on Twitter. While you could just use the Web-based interface Twitter provides, I’ve found it easier and much more productive to use a stand-alone Twitter application. There are dozens upon dozens of apps available, with more being made each day, but I found that only a select few fit my needs without going overboard. The basic, and probably most popular client app available is Twitterrific, by IconFactory. 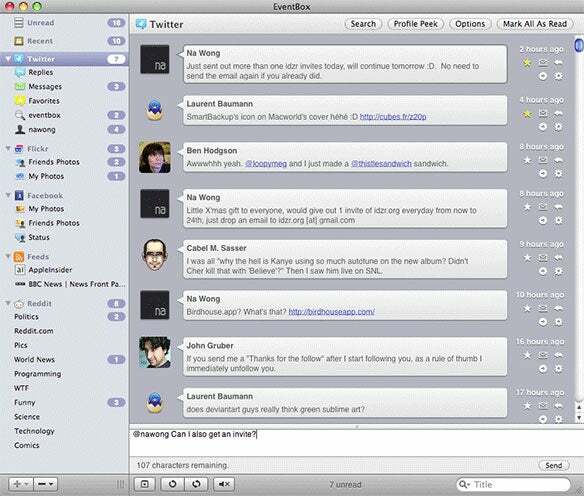 It’s a compact app very similar to iChat that offers the basic functionality of the Web-based Twitter app. 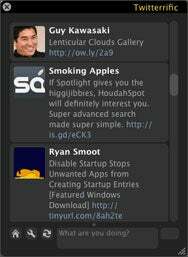 Twitterrific will display your Twitterstream, direct messages and favorite Tweets, but not much more. It’s the perfect application for laptop users who don’t have much screen real estate to spare. At the other end of the spectrum are apps like TweetDeck, an Adobe Air application, for the Twitter power-user. TweetDeck allows you to group followers into categories, automatically shorten URLs and more. Probably the most full-featured Twitter app, the problem with TweetDeck is that it’s extremely clunky, and almost requires a second monitor because the interface is just huge. I’ve used both these apps, but was left wanting more or less, depending on which one I was using at the time. Sitting comfortably in the middle is EventBox by CosmicMachine. A relative newcomer on the scene (the app is still in beta), EventBox not only handles Twitter, but Facebook, Reddit, and Flickr; it’s a full RSS feed reader as well. Because I’m also on Facebook, Flickr, and am an avid RSS reader, EventBox suits me perfectly. It allows me to keep track of multiple services without having several apps open all the time. The Twitter module of EventBox displays your Twitterstream in a window, along with icons for direct messaging, favoriting, viewing the profile of other Twitterers, searching, and more. It also offers you a way to separate certain people’s Tweets, making it easier to follow the people you consider most important. EventBox offers a plethora of customizations, and The Cosmic Machine is updating the app at a very rapid pace. GoogleReader, Delicious, and Last.fm services are being integrated into EventBox in the near future, making it even more useful. EventBox isn’t free, a license will cost you $15 right now, but if you use Twitter, Facebook and RSS feeds alone, it’s quite worth it. I’ve tried dozens of apps, but I keep coming back to EventBox. No matter what Twitter application you use or who you follow, there’s a lot of great information to be found by using Twitter. My advice is to be patient, don’t get caught up in the numbers game, and just use Twitter as just another tool in your creative arsenal.